We had a breakfast get together with some friends this weekend. We seem to do this about every 6 months to a year. I am a huge fan of breakfast, so mixing breakfast and good friends is even better. We also always have very delicious food. My friend made some amazing cinnamon rolls which I am hoping she will post on her blog. I was in charge of making a breakfast casserole. 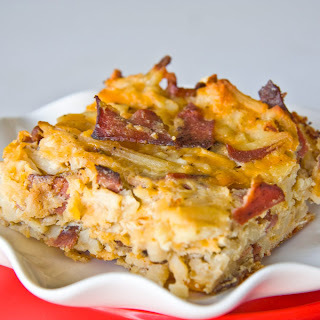 I have made a few different kinds of breakfast casserole but always love trying new recipes. This recipe was so easy to make and turned out delicious. Everyone loved it! I threw it together the night before then let sit in the fridge until the next morning when I was ready to bake it. This way I didn't have to wake up early to make it but it was still warm for everyone to eat. I will definitely be making this recipe again! In a large skillet, cook bacon and onion until bacon is crisp; drain. In a large bowl, combine the remaining ingredients; stir in bacon mixture. Transfer to a greased 13-in. x 9-in. baking dish. Bake, uncovered, at 350° for 35-40 minutes or until a knife inserted near the center comes out clean. Let stand for 10 minutes before cutting. So hearty, I wish I can have it for breakfast tomorrow!